The Orabella's Blog...: Ogun Traditional Ruler Striped Naked By Hoodlums In His Community !!! Ogun Traditional Ruler Striped Naked By Hoodlums In His Community !!! 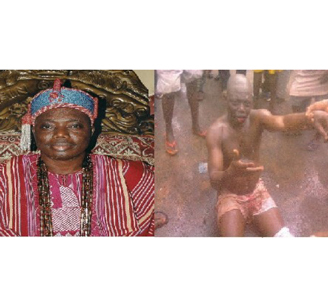 Oba Lateef Adeniran Akanni, the Olofin of Ado-Odo was attacked and stripped naked by hoodlums in Ado-Olofin, Ogun State. His palace was set ablaze and his wives and children ran helter skelter to protect their lives. This mayhem was as a result of a supreme court judgement which was in favour of him to rule Ado-Odo in January 12, 2009. The youths in the community where not pleased with the judgement because they did not want the monarch to rule over them, hence they protested. The embittered youth launched the aggression on the monarch, while he was on his way to Ilaro. He was forcefully dragged out from his jeep, he was given serious beatings and he was stripped naked. According to findings, Oba Adeniran is receiving treatment in an undisclosed hospital in Abeokuta. He sustained some injuries on his head and other parts of his body. Likewise his wives, children and palace staffs were injured too. Normalcy have been brought to the community. Those involved in this lawless act would be apprehend and brought to book.